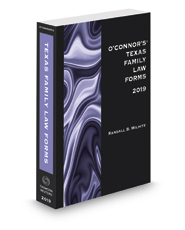 Home > Law Books > Forms > O'Connor's Texas Family Law Forms, 2019 ed. O'Connor's Texas Family Law Forms provides all of the motions, pleadings, discovery, and other documents a Texas family-law practitioner might need. Each form is a carefully drafted, highly adaptable tool that translates family law into family practice. This product's forms are well-cited with the codes, rules, and caselaw that support form elements, allowing the user to file or tailor forms with confidence.